Chris wants to be adopted... by the Pope of Trash! For starters, Ill explain the collage. There was really no reason for putting this together other than the fact that I am quite possibly one of the biggest John Waters fans. Although, Im sure every Waters fan feels the same way. I love doing different forms of artwork based around people I idolize, and Mr. Waters far surpasses the term idol, in my eyes anyways. To begin, yes, you guessed it, the large picture of the guy with the green eyes is me, and the arm poking out of the left-hand side is my arm. On it youll notice my 18th birthday present from me to myself. Yes its a real tattoo. Yes Im going to want it forever. Lots of people ask me if thats my name and I always think, Why in the hell would I get my own name tattooed on my arm? My mother thinks its funny to tell everyone its my boyfriend. Below my arm is a flyer that was given to me during the week of the Phoenix Film Festival. John was scheduled as a special speaking guest, doing a One Man Show. I was ecstatic, of course. I mean, how many people have their all time favorite film director attend their city festival? Below the flyer is my Odorama Card from Polyester that I had him sign. If you look close you can see he circled his favorite smells (2 and 9). 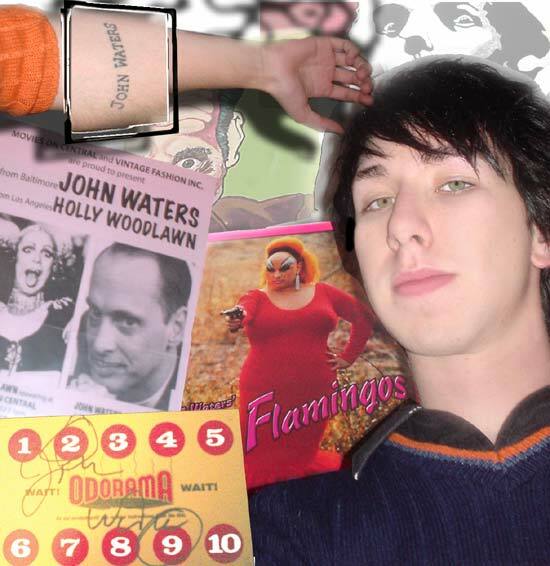 To the right is my very first John Waters poster, the infamous Pink Flamingos. And last but certainly not least, if you glance above the poster you see what looks like the cover of the biography Filth  an excellent book about the life and film career of the man himself. Well, its actually a painting I did, along with the portrait of Cecil (upper-right corner).  The entire room laughed and so did I, only I wasnt quite sure what he meant by that, so, John, if you read this someday, maybe you can explain it to me. Otherwise Im still waiting to sign the adoption papers.